Find below the steps to install linux or any other Operating system on your machine using virtualBox i.e creating a virtual machine on your system that will be treated as an independent machine. 2)Download Ubuntu from http://www.ubuntu.com/download or any other OS. 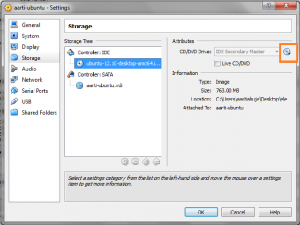 3)Install VirtualBox on your system. 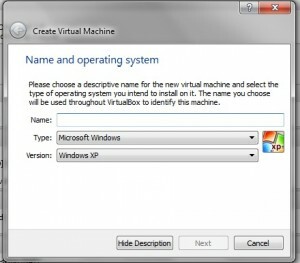 4)Once the virtual box is started, you can create a new virtual machine by going to New. 5)In the “New” window, select Type and Version of the OS that you want to insatll. 6)Once the above virtual machine is created. It will be shown in the left panel of the virtual box by the name specified in the above step. 7)You can start the machine by double clicking the machine from the left panel or selecting that machine and clicking the start button from the menu bar. 8)Your virtual machine is started but you will see a “Fatal: No bootable medium found! system halted” error as no OS is there on the machine. 11)Go to Storage left tab. 12)Select the CD marked in the above snapshot and select the CD/DVD disk drive and in that window, select the iso file downloaded in the step 2. 13)Now go to virtualBox and restart that machine. Automatically the Ubuntu setup will start, then you just need to follow the steps. 14)Once the OS is installed, then again go to settings -> storage and remove the ubantu iso file from where the OS was installed. 15)Now restart the virtual machine. After starting you will see a new machine with ubuntu setup which you can treat as an independent machine and can carryout your work. Thanks… We will surely continue posting such useful posts for our users. Keep visiting and posting your queries.